What would its vision be? I am not so sure about number 4 especially the bit about corporate profits, but the reality is that we need to prepare students for life and work is part of life, and we need money to buy the things to sustain us, so wealth has to be created and someone has to do it. I would just hope in my ideal world – getting beyond myself now, that that wealth could be shared a little more equitably than it is now. Anyway, if the purpose of school is to do all of those things, then the vision for my school is going to be something like: “Dream Big, Aim High but Keep it Real and don’t forget your Mum”. Okay then, a bit tongue in cheek but I would encourage my students to try their best, aim to be the best that they can be, recognise their talents and those of others, be humble but be proud, care for each other, their family and friends and the wider community, be empathetic, courageous and always remember where they have come from as they strive for what they wish for. I would encourage them to learn widely, not limit themselves to a narrow experience of subjects, be curious about nature, the world, science, arts, languages, make connections with the past and create pathways to the future, build relationships, laugh, sing, run, jump, make time for themselves to be quiet, to reflect and to talk to as many different people as they can. I would encourage all members of the school community to make connections with the land in which they live, both the physical geography and also the people who have shaped it, the conflicts they have endured and the relationships they have forged. I would help students understand that the hub of all cultural locatedness is the ‘marae’ or the spiritual centre of a place. Depending on the country and its cultures this could be a church, a mosque, a ring of stones. As citizens we have a responsibility to find out and use correctly the names of local landmarks such as mountains, rivers or lakes and buildings. We also should gain a basic understanding of the different protocols and language that enable us to interact in culturally sensitive ways. My school would not have any walls. The world is my school. Learning is everywhere. I haven’t really thought about how it will actually function yet – this is an ideal, a dream isn’t it? So I have made a ThingLink to illustrate how learning can happen. (It is still under construction, but thought I’d share anyway). Hope it works!! Some intriguing and thought-provoking ideas from the BBC. A competition that invites people to submit ideas about what the future might hold for us. This competition links in appropriately with the Coursera cMooc I recently completed when we looked at utopian and dystopian views of the world, past, present and future; the role that technology has played, plays and will play in the development of the world; the integral role and responsibility that we have in that development in terms of shaping society, societal values, the environment and the way that we live. There are some fascinating suggestions which I will explore in greater depth but one of the things the BBC did was to ask 6 artists to provide images that represented their ideas of the future. Chema Madoz‘ vision is more bleak but a reminder too that we have to take responsibility for the world we live in and take measures to protect what is, after all, our lifeblood. Well, that was quite disturbing! Is life a game, or is the game life? How does one differentiate between what is real and what is not? I guess relationships are a game, a game of strategy, of manoevering, of compromise, of second guessing, of intuition… I am uncomfortable about this short and the ideas it suggests to me of mind control, of brain washing, of “Big Brother”. For centuries men and women have counted the “notches on the bedpost”; in battle soldiers have kept a tally of the number of the enemy they have killed; how many fish have been caught, how much game has been bagged; competition is part and parcel of life and is what drives people forward to improve and develop. Is that why computer games which are based on accumulating points, conquests, trophies have been so successful? Relationships are also often a power struggle and the protagonist who has most power is often the one who has the most information. In this short the male clearly has plenty of information and as the story develops, it is also clear that he thinks he has the upper hand. I am not so sure though; has he met his match? Has he taken control of her to re-configure her profile or will she resist? Maybe I just want to believe that she is not a victim? In contrast to the sleek, pristine, clean backdrop of the first two films, this film seems outwardly more sinister. The atmosphere is darker and more menacing and the empty walls of the character’s apartment hide what is underneath. In the future will we be able to use facial recognition and body language sensors to help us know what to do in any given situation? Will we be able to inbuild a sort of intuition that is sensitive to mood and circumstance? That could, of course, have a positive effect on society much like the robot seal that one poster mentioned that affords some comfort and healing to convalescing patients. Will the technology control us or will we control it? It comes back to the idea of what motivates people to invent and create? In this film, it felt to me quite negative, a dystopian vision rather than utopian. Now this is the sort of technology that helps to create a more utopian vision of the future. A “simple” tool that can help detect illnesses in the field so that people can be cured or at least treated. As I said before, I think, practical applications for real context solutions. A tool that can help the people who need it and not just those with the money to afford shiny, pretty things! Finding this article has got me thinking though about the inequality of access to medical care in the world. Well actually I started to think about if everybody was treated and cured then the world would be vastly overpopulated. The natural order of things; birth, life, death would be upset and where would that lead. But that brought me to the thought that not everyone in the world has cheap and ready access to medical care so the natural order would not be evenly spread around the world. And hasn’t that always been the case? Even in wealthy countries there are those who can afford access to health care, education, legal advice and those who can’t. Going back to the videos “A day made of glass” and the Microsoft advert, I ask myself who the target audience is. Clearly the “haves” and not the “have nots” of this world. A utopian vision of my world would be where the “have nots” have equal access to education, healthcare, housing, clean water. The technologies that can provide those sorts of things are those that can change the social order, determine how society will be in the future. Sugata Mitra’ “Hole in the Wall” experiments that provide children with the ability to access education have proved revolutionary. Malala Yousafzai, the young girl shot in the head by the Taliban has a vision for girls in Pakistan to have access to education without fear of being killed. It is the desire of people, the soul of people that impels them to create the circumstances, to invent the technology that changes society. The technology alone is not the determining factor. I really like this film, not sure why since at first it seemd so bleak and definitely “end of the world-ish”. Reminiscent of H G Wells’ War of the Worlds “walkers”, that lumber ominously across desolate landscape, these giant metal structures/creatures float in the sky like giant jellyfish. They are machines that are animalistic rather then humanistic but there is a sense that they have some feeling, some soul. They seem unhappy, ponderous, searching like lost souls. Can machines have a soul? Makes me think of Marvin the paranoid android from Hitch Hikers Guide to the Galaxy! Do we humanise machines? I think we always have and there is certainly an element that we have either idolised or demonised technology and new inventions throughout history. We are either for new ideas or against new ideas, there is not always a middle road. Think of the Luddites for example; wreckers of machines and opposers of technological change. And in schools there are those who are keen to embrace change and those who cling to the comfortable past …. Men have tended over the years to feminise their cars; I know my Dad had names for his cars, not always female, it is true, but I remember the “Green Goddess”, and “Maggie May” along with the “White Wonder”! Cars, boats and planes are referred to as “she” by their (usually) male owners. Languages have different genders for their nouns – in French, how did the word for car “la voiture” become feminine, but “le bateau” or “l’avion” masculine? And how is it that in German a car is masculine – “der Wagen”, or even neuter “das Auto” and in Spanish (“el coche”) it is masculine? Does giving objects a gender humanise them, give them a soul? Coming back to the film we see a dystopian landscape; desolate, abandoned, ivy covered buildings; overturned , rusting cars, with bits of machines rolling down the streets like tumbleweed in a mid-west cowboy movie. There is a connection here of nature with machines – a recurring theme of the shorts that we have seen. Nature has been an inspiration for man’s machines – helicopters, aeroplanes, amphibious craft – we have taken the wonder of nature and tried to re-create it (and make it better?) Is our downfall the fact that we are overreaching ourselves, that we have tried to make something better and that it is going to come back and bite us? In seeking our Utopia we actually find Dystopia? What a bleak and epressing thought! 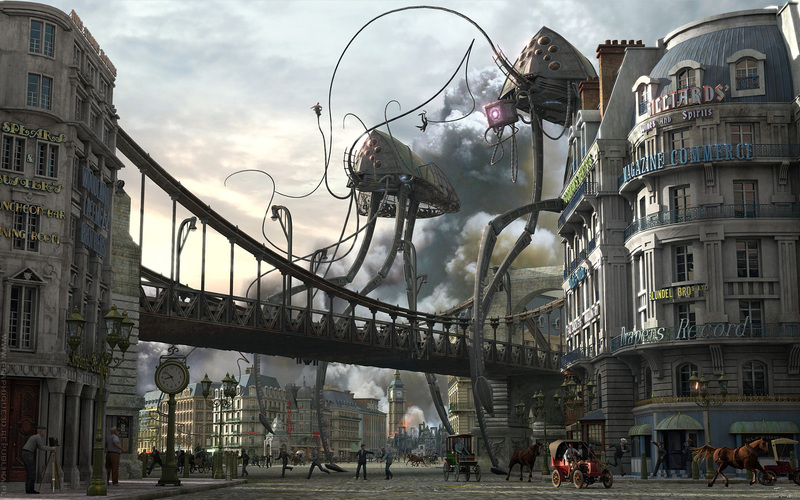 The snake-like tentacles reach out of the buildings – or are they reaching in? Is it defense or attack? Despair or hope? Is the “tumbleweed” being pulled towards the floating machines against its will or is it a willing journeyman, heading towards hope? Dystopia or Utopia? And then the abandoned phone, the disconnected voice – how many times do we try to connect to find that nobody is there? Leaving messages hanging in the ether…. Finally we see the tentacles as wires connected to headphones attached to man. Are we being brain washed? Are we becoming slaves to machines? Have we always been slaves to technology? Are machines our gods as in Bendito Machine III, easily cast away as the next new, bright, shiny thing comes along? Do we control machines or do they control us? Do we give them voice? Do we give them soul? Still not sure that New Media is dystopian. I like to think that those machines do have a soul, that they are searching. Searching for something better, searching for home…..
Just trying out an application suggested in a tweet – still needs a lot of work but looks like it could be an interesting tool to use…. and I wonder if pechaflickr could be a way to go – quite random but certainly an option! Why not have a play! I found “Thursday” an interesting short. My first thought was how similar the street grid system seen from above like the grids on the old computer games but I agree with some of the comments on the discussion board that the street grid system is like a computer motherboard. Are we all living in a huge game? Where do reality and make-believe merge? Can we escape the automation of daily life and choose our own destiny? Maybe that is what the couple were doing when they went on their outing on Thursday? I think that the way that the bird mimics the sounds around it is like the way that we have copied nature’s designs to build machines. It is ironic, but also we adapt the way we act and speak to fit in with our surroundings especially when we are in unfamiliar or challenging situations so as not to stand out and as a way to survive. Maybe this is a dystopian struggle for survival? But then if their day of escapism is hope for the future maybe it has a utopian element? Other people have commented on the sadness of the people’s dependence and absorption in their gadgets, their machines and how when the power went out they found themselves bereft of anything to do. Is that dependence stripping us of the ability to be creative, to think for ourselves? It is certainly the cry of lots of parents, and I hear myself saying it to my children too! When we turn off the internet or tell them that their time is up on their computers or tablets they mope around for half an hour until they remember (or are reminded) that there are other things to do! We try to play family games but I am frustrated by how infrequently we do that now since my husband and I too are often to be found with our heads staring at a computer screen. It is also easy to let our kids play on computers – a cheap babysitter, just as the TV has been the baby sitter in previous years – so that we can get on with what we need to do. 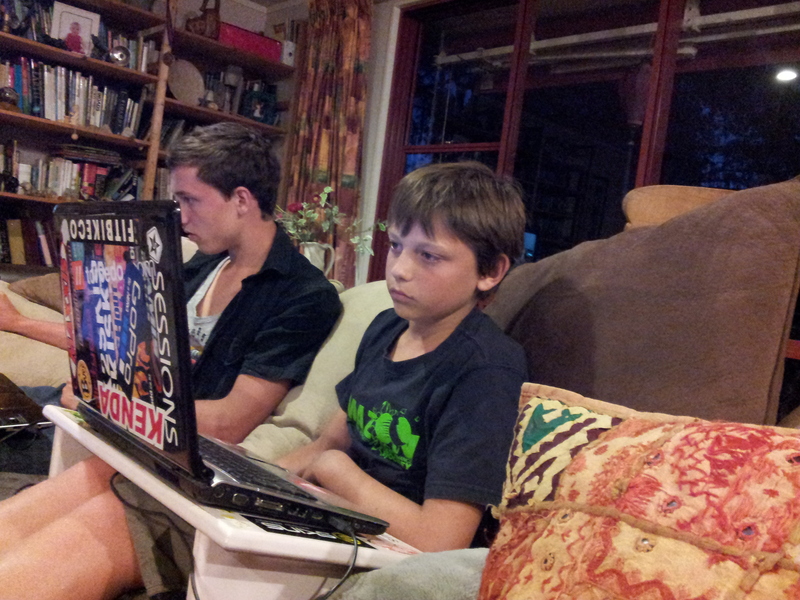 Interestingly, I have observed that my boys communicate more through the medium of computer games than face to face. Of course, they still have the rough and tumble of brotherly play, they are both keen sports players and we spend a reasonable amount of time outdoors. But the games they play require them to play as a team against another team, so they have to discuss strategy, make decisions, build things and interact. Sometimes they do this sitting next to each other as in the photo, sometimes they are in separate rooms, and it maybe that when the older brother goes away later this month they will play across continents. I think that the skills they are learning and developing during this play time will help them to grow as adults and help them in their lives. Prince Harry said recently of his role in Afghanistan working as a helicopter gunner “It’s a joy for me. I am one of those people who loves playing Playstation and XBox and so I am good with my thumbs, I like to think that I am quite useful.” Those comments have caused quite a stir but I think that he is right – I have read research (but can’t quite find sources just now) that suggests that parts of the brain are stimulated when playing computer games which help in quick decision making and manual reflexes. The interactive nature of computer games now is, I believe, far preferable to one on one games that require interaction only between the computer and the player. A friend of mine remarked on that the other day when I went to pick up my 13 year old from his friends’ house. They are twins and when I arrived, my son was playing an interactive game with one of them, they were in separate spaces in an open plan area so we could see both of them and they spent the whole time talking to each other, deciding who was going to do what, which bounty to collect, how to attack, counter-attack, defend etc. 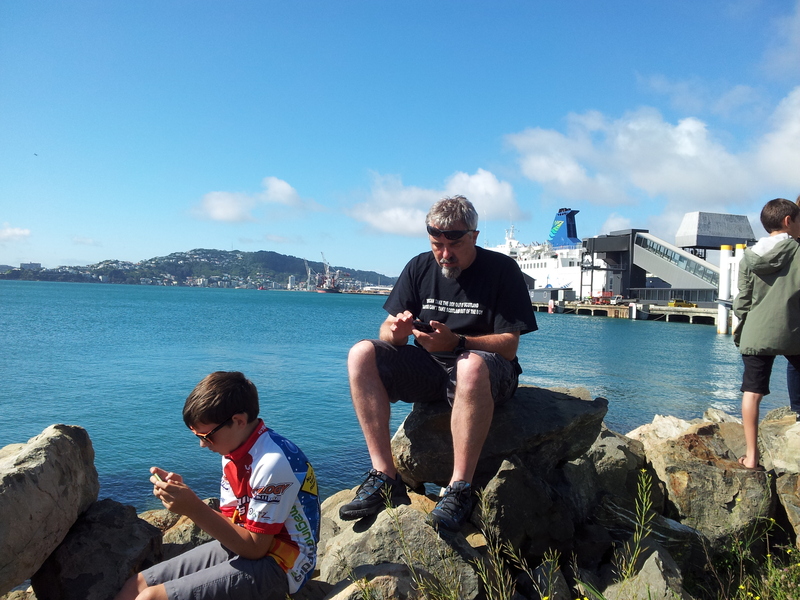 The other twin was playing on a handheld device, completely self-absorbed and seemingly isolated. That is not to say that there isn’t a place for one to one time, but a healthy balance is needed. Which brings me to the idea in the film that people are so governed by their machines that they no longer notice the world around them. It is easy to see how this can happen – computer games are addictive and it is for that reason that I avoid them; I know I will get sucked in, I know because it has happened to me! Fortunately, I don’t think I have a particularly addictive personality and I usually get bored after the mania has run its course and I move onto the next thing. But I do have a busy and demanding job, one that I love, but the demands of the job mean that I often come home from work and then immediately sit down at the computer and start again because I have stuff that I have to do for the next day. I find myself missing out on the things I really love doing like spending time with my family, being outdoors in the hills or by the sea. I am doing this course because the subject interests me but it too means that I am focussed on the computer. Fortunately, it is summer here and I am sitting in the garden with cicadas chirruping, birds singing and the smell of the roses all around me. But did we miss out on the world around us by having our gadgets on us the whole time? I don’t think we did; I think that in many ways they helped us to look at the world in a different way. I enjoy photography and using instagram has encouraged me to look at what is around me from a different perspective – I like to upload photos that say something to me, they are contextual, they also reflect who I am as a person. I still use my SLR camera for more planned shots but the immediacy of a camera on my mobile phone fulfils my need for instant gratification and feedback from my followers! Keeping a balance is important and I know there are times when, as a family, we fail. However, I think on the whole we do a pretty good job and hopefully the boys will maintain that when they no longer have us as guardians of cyberspace. On that note, I am taking a break. Going for a coffee with my husband who is also engaged in a Mooc and needs dragging away!